Catalina Echeverri's original and colourful illustrations add warmth and vigour to a retelling of the greatest of stories. With a big emphasis on who that baby was and what he came to do, this book puts the manger into the context of the whole Bible story. In so doing it avoids the twee and merely sentimental without any loss of charm. A great gift for a young child at Christmas. What a fantastic fun and fresh retelling of the Christmas narrative! 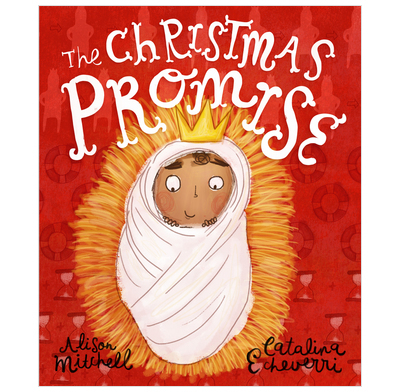 The fulfilment of God’s promises for a new King, a rescuing King, and a forever King are brilliantly presented, through beautiful illustrations, simple and repetitive yet faithful text, and the catchy ‘whoosh' of the angel. Children and parents will love this book! Hooray for a retelling of the Christmas story for children that is both biblically faithful and tremendously engaging! “The Christmas Promise” combines a clear and imaginative storytelling style with wonderfully rich and vivid illustrations. It lends itself to reading and re-reading. The wonder of the Christmas story flies off its pages! I bought this book for my 3 year old as we looked forward to Christmas. She really enjoyed listening to the story and re-telling it. I enjoyed reading it to her as it was a slightly different perspective to the 'normal' children's story of the nativity. The illustrations are colourful and add to the story. I love the illustrations in this book which make it feel very special. I think this would be a gentle introduction to the Christmas story for a non-Christian, whilst also being quite different from most other nativity books (the focus being on who Jesus is instead of the usual "no place at the inn"). I love the way it picks up themes from the Old Testament - so there's lots in here for a Christian to pick up on and point out to their children. I would say it's a great book to give as a gift to anyone with children aged about 3-8. This is a super book for children. The illustrations are gorgeous and fun with lots of detail. I love that it captures Jesus as a toddler when the wise men visited, and not a baby. The text is clear and faithful to the Bible. The whooshing angel is wonderful! We've based our whole children's programme around this book this Christmas. Great to be able to give away the advent calendars that went with the book to non-church families too. I have bought 100 of these to give away at our christingle. We will use the forever /rescuing/new king themes both then and on Christmas Day . I don't think this is inaccessible to non Christians but rather the opposite. It's both fresh and true to scripture. Excellent book. 10 out of 10! Best read by a Christian as there's a lot of imagery and text that's not obvious to a non Christian and therefore they'd miss bits and not be able to answer children's questions fully.